Lighter Fluid Poisoning is the accidental or intentional intake (swallowing) of lighter fluid. The fluid is flammable and its contents are toxic on ingestion. What is Lighter Fluid Poisoning? What are the Causes of Lighter Fluid Poisoning? What are the Signs and Symptoms of Lighter Fluid Poisoning? The signs and symptoms of Lighter Fluid Poisoning can vary from one individual to another. It may be mild in some and severe in others. Several systems of the body, such as the respiratory, urinary, digestive, vascular, nervous, skin and ENT systems, may be affected. How is First Aid administered for Lighter Fluid Poisoning? Who should administer First Aid for Lighter Fluid Poisoning? 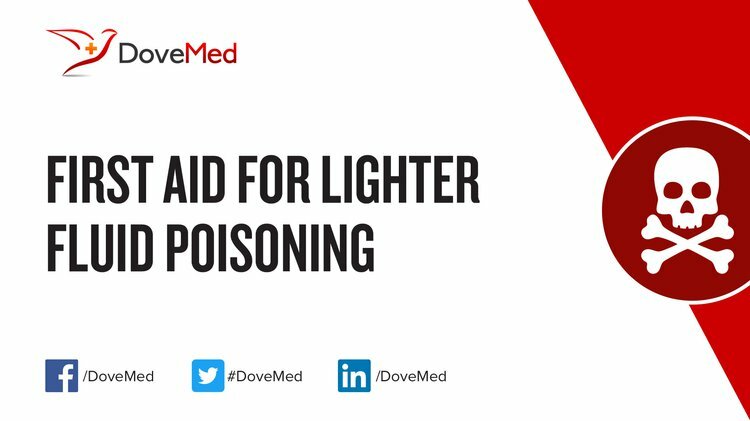 First aid for Lighter Fluid Poisoning is administered by healthcare professionals. What is the Prognosis of Lighter Fluid Poisoning? How can Lighter Fluid Poisoning be Prevented? Hasegawa, K., Wurita, A., Minakata, K., Gonmori, K., Nozawa, H., Yamagishi, I., ... & Suzuki, O. (2015). Postmortem distribution of AB-CHMINACA, 5-fluoro-AMB, and diphenidine in body fluids and solid tissues in a fatal poisoning case: usefulness of adipose tissue for detection of the drugs in unchanged forms. Forensic toxicology, 33(1), 45-53. Kelly, T. (2012). Clarke's analysis of drugs and poisons. Kleinstreuer, C., & Feng, Y. (2013). Lung deposition analyses of inhaled toxic aerosols in conventional and less harmful cigarette smoke: a review. International journal of environmental research and public health, 10(9), 4454-4485. Weibrecht, K. W., & Rhyee, S. H. (2011). Acute respiratory distress associated with inhaled hydrocarbon. American journal of industrial medicine, 54(12), 911-914. Novosel, I., Kovačić, Z., Gusić, S., Batelja, L., Nestić, M., Seiwerth, S., & Škavić, J. (2011). Immunohistochemical detection of early myocardial damage in two sudden deaths due to intentional butane inhalation. Two case reports with review of literature. Journal of forensic and legal medicine, 18(3), 125-131. Marsolek, M. R., White, N. C., & Litovitz, T. L. (2010). Inhalant abuse: monitoring trends by using poison control data, 1993–2008. Pediatrics, 125(5), 906-913. Benedict, B. A. (2012). Modeling of toxic spills into waterways. Hazard Assessment of Chemicals: Current Departments, 251.